Some people like to book those last-minute deals for their big holiday of the year, while others already start thinking a year in advance about where they want to go. In South Africa and other parts of the world, there are unique and popular spots where booking last-minute is a no-go, especially at certain times of the year. Some are attractions where they only allow a limited number of tourists, special accommodation spots book up quickly and popular hiking trails have long waiting lists. If you like to save up and plan far ahead for those extra-special holidays, here are the top spots you should really book a year in advance. The Whale Trail traverses through the De Hoop Nature Reserve for 55km over five days. From Potberg to Koppie Alleen, hikers are by themselves in rugged natural beauty and it's one of the best spots to see whales from land. You lounge around on the tranquility that is the Langebaan Lagoon on the West Coast in one of the Kraalbaai Luxury Houseboats. The seaside adventure hub is most pumping during the holidays, but you'll have to book far in advance if you want to be in peak party mode on top of a boat. The Otter Trail on the Garden Route is one of the top bucket list items of Saffas. 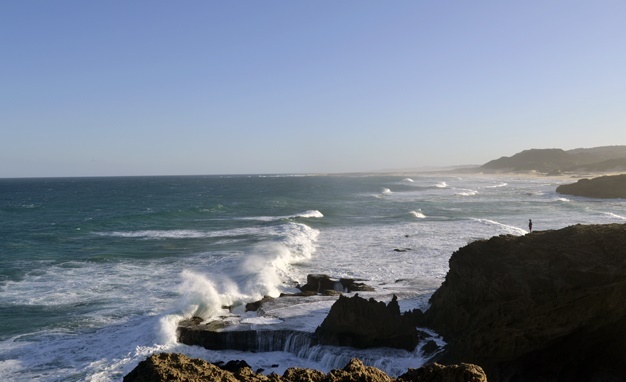 It follows the Eastern Cape coastline from Storms River Mouth to Natures Valley in the Tsitsikamma National Park. The trail is a 42.5km long hike that takes five days to complete, where you'll walk on sandy beaches and traverse rocky routes ranging in elevation from sea level to a height of more than 150m. The Kruger National Park is by far South Africa's most popular wildlife area, and the park's affordable accommodation within its fences is widely sought after, especially during school holidays. Bookings open 11 months in advance, but a special booking period is implemented for extremely busy holiday seasons. Hike from Port Alfred to the mouth of the Fish River on the Sunshine Coast, where many ships have been lost trying to go up the Kowie River. It's a five-day hike with a total of 67km and a 16km canoe ride. SEE: Shipwreck Hiking Trail: Pure slackpacking magic! The Fish River Canyon is the second biggest in the world, and this famous trail that meanders about 67km of the 90km Fish River. It's filled with steep climbs, stunning panoramic views and sleeping under millions of stars. SEE: 'The Fish' is tough, but you will be back for more! The world's largest cave doesn't only have a one-year waiting list, but a two-year waiting list! Only one tour operator is allowed to take tourists on a five-day expedition through the cave, and only 500 visitors are allowed in a year to protect its sensitive ecosystem. The largest waterfall in the world has throngs of visitors year-round, but the popular tourist attraction on the Zimbabwe-Zambia border becomes one massive party over New Years. Spaces and flights get booked up fast, so booking yourself a spot as early as possible gives you the change to get the best seats in the house. You can take on a section of the Himalayas via Nepal, a popular trekking route, but it's not just booking you have to do a year in advance - you also have to do a lot of training to be able to hike in the high altitudes and condition your body to stand the icy cold. While it was easier to visit this iconic world-renowned landmark, overtourism and pressures from UNESCO have resulted in the Peruvian government capping the number of tourists to 2 500 a day, and only 500 people (including guides and porters) are allowed per day on the four-day Inca Trail around Machu Picchu. Tokyo and cherry blossoms are a common feature on many postcards and iconic photos of the Japanese city, and between March and April it's is peak tourist season with accommodation booking up fast near parks covered in pink during spring. Not even the various versions of the Holi Festival in South Africa can compare to the colourful extravaganza in its home country, India. Usually taking place at the end of February or somewhere in March, the most popular spots to participate in the festival is in Mumbai, Delhi, Mathura, Vrindavan and Goa, all of which will be booked to the brim during this time. This ancient Buddhist kingdom is a beautiful place filled with temples, mystery and a traditional way of life, but getting in is a bit trickier. There's a cap on the number of tourists that can visit the kingdom, and you have to book through an official tour operator to get in and pay a minimum all-inclusive $250 (about R3 560 at R14,24/$) per day for the duration of your stay. Off the coast of Ecuador, you'll find the pristine protected marine environment of Galapagos, which helped Charles Darwin write his theory on evolution. Getting here takes quite a bit of planning and if you want to dive you'll have to book a spot far in advance on one of the few dive boats that service the islands.